Tigermoths class have begun to incubate 3 bantam eggs. We hope they will hatch after the Easter holiday! Falcons class have been very fortunate to have been given a tropical aquarium to look after and maintain as part of the Fishkeeper Fry programme by Maidenhead aquatics. The children had an amazing experience when chemist Professor Tim Harrison from Bristol University visited our school today! The children learnt about gases in the air and their properties. This is part of an exciting series of science events that we are holding in corporation with the East Salisbury Science Schools' cluster. Professor Harrison was impressed with the response of the children and their sensible behaviour. On Friday 7th October, the staff and children at Old Sarum Primary School celebrated World Space Week by having a Space-themed day. 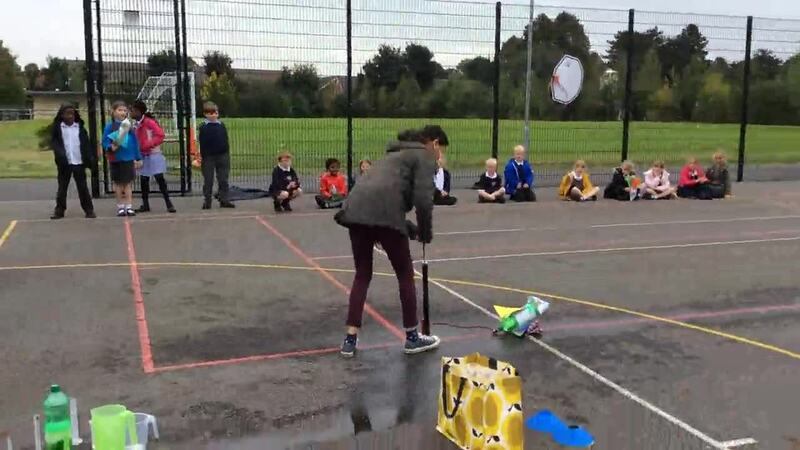 Each class organised practical science experiments linked to Space and The Earth and Beyond. It was a fantastic day and children were using their scientific enquiry skills to ask and answer questions linked to their learning. Take a look at our gallery to see what each class got up to! Our first Fishkeeper of the week - Chloe!